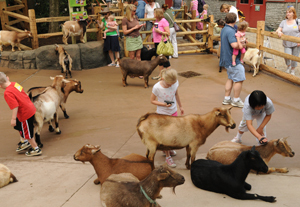 The Children’s Zoo is the perfect place for families to relax, interact with animals and have lots of fun! The exhibit features a petting yard, animal nursery, playground, and a variety of animals including baby miniature cows, llamas and alpacas! Visit animals in the Animal Ambassador Center like bat-eared fox, owls, a bearcat and more! 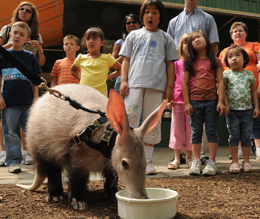 Keepers and volunteers bring animals out for enrichment, up-close encounters and special talks. Do you know the difference between an alpaca and a llama? If not, ask a Zoo employee the next time you visit. Children can swing like monkeys, hang like pottos and balance like cats in the “Be the Animal” playscape. 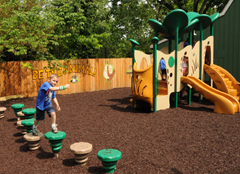 The play area features a slide, crawl tunnel, monkey bars, balance beam, synthetic mulch, as well as the always popular spider web and turtle shells, and much more. The expanded petting yard allows more space for children and families to interact and even brush some of the Zoo’s friendliest animal residents, including baby pygmy goats, Nigerian dwarf goats and NEW baby doll sheep. You might get to race chickens or train a goat to jump through a hoop during Blakely’s Barnyard Bonanza Show. There’s plenty of seating and space in the expanded yard. Check schedule for times.